Because zaatar. And the pickled onions! 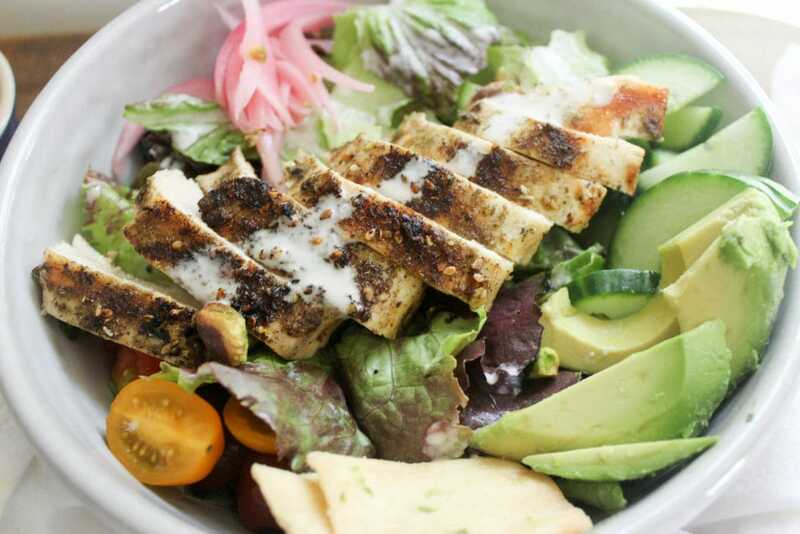 And Lemon Tahini Dressing, which remains one of the most popular recipes on this website. It makes me smile because it’s one of my favorite types of dressing in real life, so I’m so glad you like it too. The premise here is simple. We need a new entree salad, and we need it to be wonderfully flavorful. Otherwise, entree salads lead to excessive garlic bread on the side. Garlic bread isn’t a bad thing, but excessive quantities of it might be. MIGHT. I’m also a fan of anything that feels fried but isn’t fried, which is the case with the spice-covered chicken. Do you know about zaatar? It’s a Middle Eastern Spice blend with sumac, sesame seeds, cumin, and other spices based on who makes it. I find it at our local Middle Eastern grocery, but bigger grocery stores carry it in the spice aisle or international foods section. If you haven’t tried it before I’d highly recommend it for a new twist on a great summer salad. You need! Chicken breasts, and I’m so sorry about that blob of fat. Zaatar, or Google how to make your own. Lettuce, the pickled red onions from the other day, tomatoes, cucumber, pistachios for crunch, mint leaves, avocado, lemon tahini dressing, and pita chips because we can’t go too low carb, we aren’t animals. You can feel free to customize the salad part however you’d like, but these are my favorite flavors to go with the chicken and the dressing. 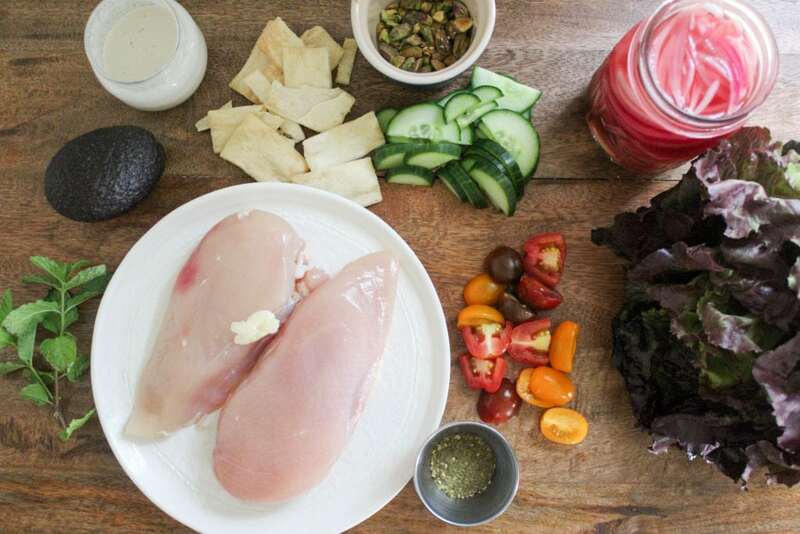 For the chicken, sprinkle it all over on both sides with lots of zaatar and a little extra salt. 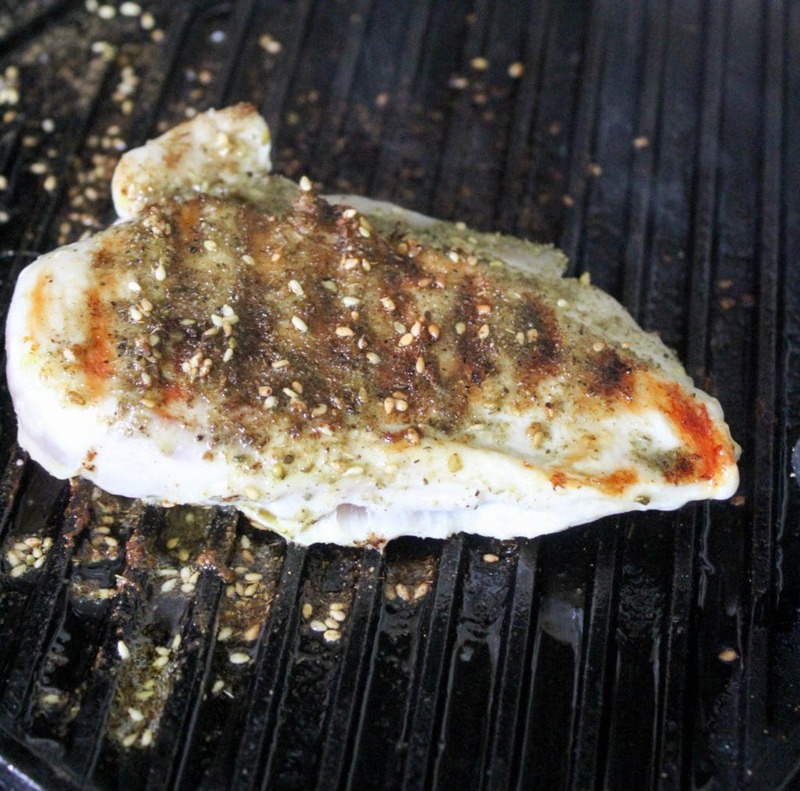 Preheat a grill or skillet to medium-high with some olive oil. Cook the chicken for about 7 minutes on each side to get nice grill marks and cook the chicken all the way through without drying it out. Let the chicken rest for about 10 minutes before slicing it. While you do that, assemble your salad. 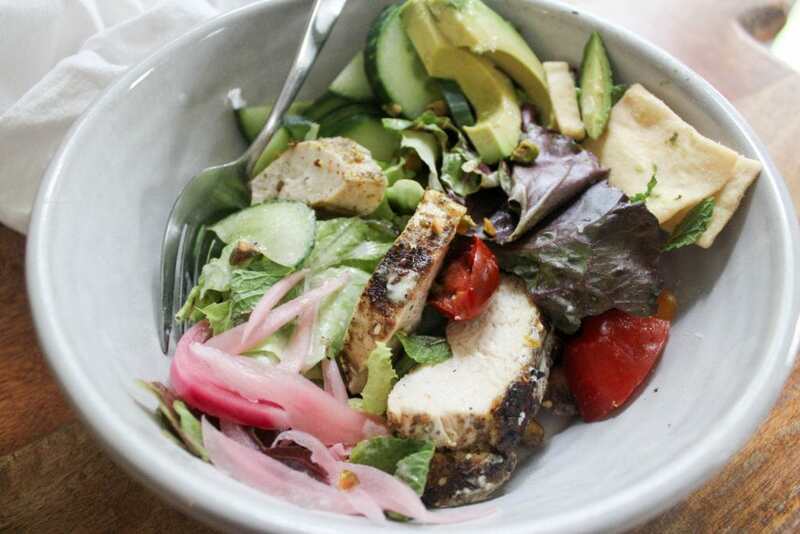 I like a bed of lettuce topped with all the veggies, then sliced chicken and avocado right on top. 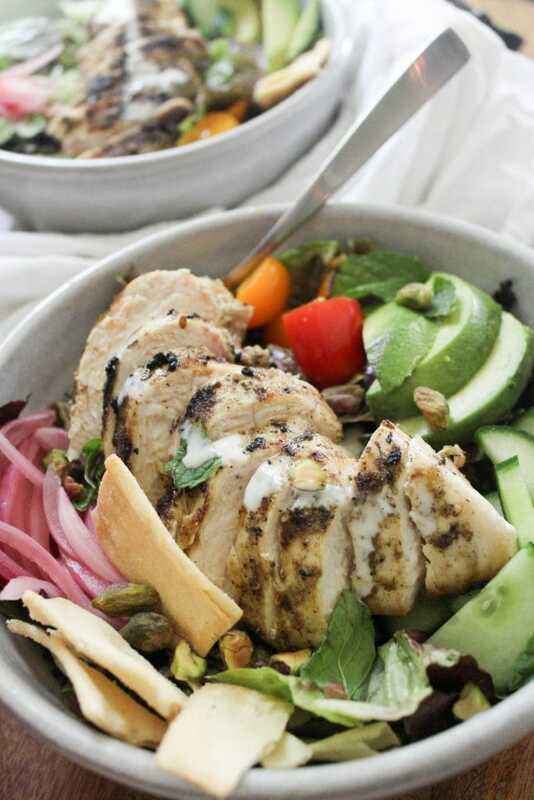 Dressing over everything, torn mint leaves and chopped pistachios for crunch. That’s it. A new favorite lunch or dinner, perfect for hot days or anytime you don’t want to eat a burger and fries. Do we ever not want to eat a burger and fries? Let’s discuss. Either way. 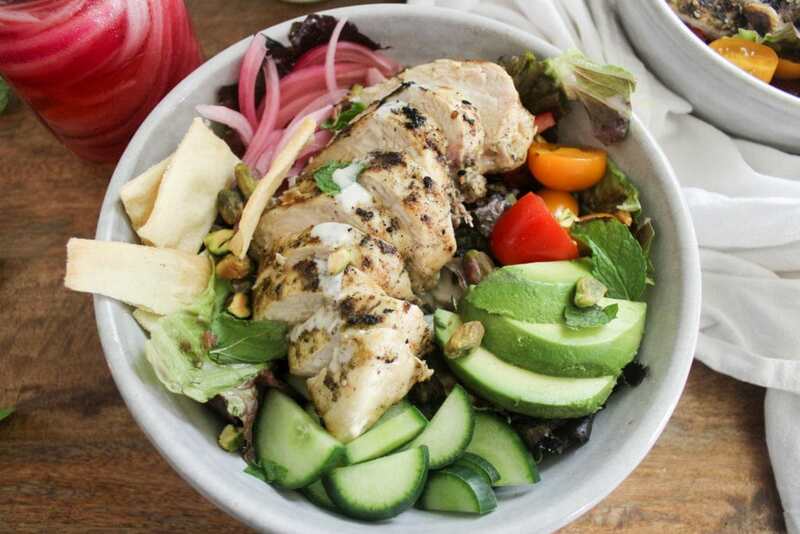 The flavors here are really wonderful altogether, charred chicken with tangy dressing, creamy avocado, and zingy pickled onions. Balance doesn’t even begin to describe it. Preheat a skillet or grill pan to medium high heat with some olive oil. 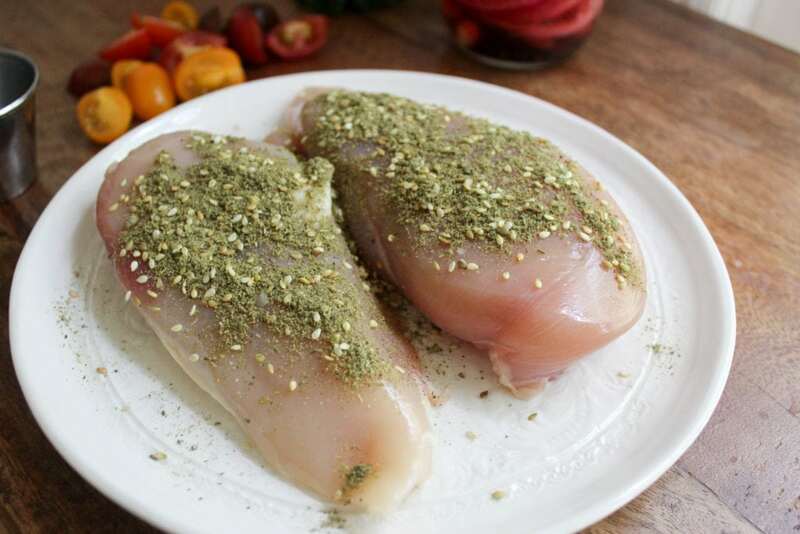 Sprinkle the chicken all over the with the salt and zaatar. Grill the chicken for 5-7 minutes on each side until cooked through, then move to a cutting board to rest for 5 minutes. Slice the chicken before serving.